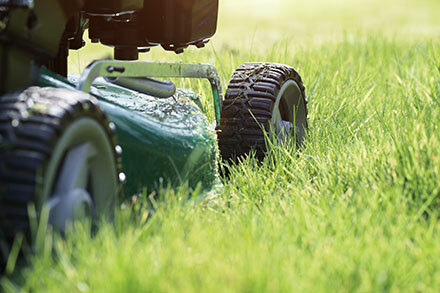 How Short and How Often Should We Cut Grass? The truth? It depends on many things such as where you live, the type of grass etc. but there are guidelines. Weather will greatly affect the rate at which the grass grows. For example, if there’s a spell of wet weather but the temperature is still quite warm you will notice grass shooting up very quickly as the as combination of heat, light, moisture and the nutrients in the ground is exactly what grass needs to grow. Take one of these key factors away and grass growth slows. This will have the biggest impact on how often you need to cut. So, first cut of the year and probably the most important one. The general rule of thumb is that you can dust the lawnmower off once the weather starts to get a little bit warmer, probably around March- April time when the grass really starts to grow again. Don’t forget to give your mower a once over before using. If you live in the southern parts of the UK you will be probably be getting the lawnmower out earlier as the climate is warmer. EASY MISTAKE - Generally, we all like a short and tidy lawn, however the problem with this is that we often cut far too short on the first cut. Tell-tale signs that your grass has been hacked are that it can turn yellow and generally a bit unsightly. SOLUTION - Have you ever heard of the one third rule? Basically, the rule is that you shouldn’t cut more than a third of the blade of grass off in one go. Going shorter than this can seriously damage your grass. Our recommended approach would be to cut your lawn over a number of weeks adjusting the cutting height of the mower until you’ve reached your preferred length. So raise those blades if you can! From spring to early summer, based on normal UK weather conditions you’ll probably only need to cut the grass once or twice a month. When things really start to heat up come July you may need to cut the grass once or twice a week as grass is growing at full steam. Repeated cutting can create a nitrogen deficiency. The solution to this problem is a good slow release spring/summer fertiliser which you can buy here. This will breakdown slowly over 12-16 weeks and help ensure your lawn everything it needs to thrive. At the end of summer when the weather begins to cool again you will notice grass growth slowing too, leading to less mowing. The frequency and length that you cut grass is entirely up to you but if you follow the basic guidelines above you’ll sail through this grass growing season with a lovely looking lawn!